Their son, Hudson, is struggling at school: he’s socially awkward and not fitting in. Don’s spent a lifetime trying to fit in - so who better to teach Hudson the skills he needs? Hilarious and thought-provoking, with a brilliant cast of characters, The Rosie Result is the triumphant final instalment of the much-loved and internationally best-selling Rosie trilogy. Why do we “neurotypicals” find Don Tillman so endearingly fascinating? There’s something very compelling about a person who faces life problems with a guileless rationality. What’s also important is that in this cynical, wicked world of ours, Don is always concerned to act ethically, for individual and greater good. In this novel he applies his problem-solving skills to his son Hudson, who is having a hard time at school. The school wants Hudson to be tested for autism, so Rosie and Don embark on a mission to discover whether this is wise. This is one of the themes of the novel: should people on the spectrum be trained to fit in, or should society be more accepting of difference? Don reflects a lot on his own upbringing. Then there’s the issue of Rosie’s research work: should she go part or full time? After an unfortunate incident at a university lecture, Don is pilloried for political incorrectness re race. (Thus making PC-ness v free speech another issue.) With typical Tillman logic, Don decides to quit work, devote his time to Hudson (thus allowing Rosie to work full time) and leverage his cocktail-making skills into a bar to bring in money. Hudson de-glitches the drink-ordering app Don devises. With the flair we’ve come to expect from Simsion, these and other issues are parlayed into a funny, uplifting, thoughtful novel that you just love to read, and that will surely be as successful as the other Rosie stories. Just dive in. So good to be in Don Tillman's head again! Still the most unique and compelling lead character I have ever read. 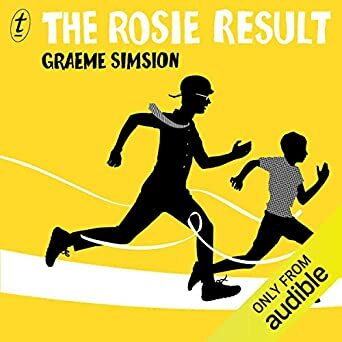 ‘The Rosie Result’ is the third book in the Don Tillman trilogy by Australian author Graeme Simsion. Other than job applications and performance reviews, life is virtually perfect for Don, Rosie and young Hudson in New York. Yet fast forward eight months and a job-related transfer to Melbourne has unsettled Hudson, now eleven... which now Don rates this the most severe of the five problems that he has identified as affecting his overall contentment. While Don provides the reader with plenty of humour, Simsion also uses events, and the family’s reaction to them, to explore the myriad of issues surrounding autism. A highly enjoyable read, just delightful. I shall miss Don, Rosie, Hudson and their friends. 5.0 out of 5 starsCompelling and enyoyable reading. The Rosie Result is a great finale to the "Rosie" novels. I have read all three of the "Rosie" novels and formed a strong connection to the characters along the way. This is a result of the great skill of the author. I found the books easy to read given the quality of the writing and the interest the author ensured I kept in finding out what happened next. The author takes you on a journey with the characters as they figure out a way to make their life meaningful and happy. I had a lot of fun reading the book and I commend this book to anyone. Whilst I thoroughly enjoy reading the continuing adventures of Professor Don Tillman, and his struggles to combat bias and prejudice, I am somewhat surprised by how intolerant he is of me, and some of the trite and generalistic conclusions and observations he makes regarding what I consider to be some of my core life choices. This is even more surprising in light of the fact that neither he, nor his creator have in fact, ever met me. It is the only disappointment that I have with, what have otherwise been, excellent books. This book has kept up the standard of the earlier two. It is great fun, highly amusing and easy to read. However it has a very significant underlying message about autism and anybody on the spectrum can feel encouraged for their own success. I highly recommend the book simply as a fun novel to read, but also as a book with an important message. A fantastic read, as expected. Love the Tillman family whose lives are not just joyful,exciting and rich, they also guide us in how we might make better informed decisions, to see and value diversity and i refuse to understate the value of logic. Feeling sad the journey has ended but am enriched by the experience and offer heart felt thanks to the author for what was a joyous trilogy. As with the first two books I loved every moment of this book.I didn't want it to finish. Don is one of my favorite characters. Please read all the Rosie books.They are the best.